Since I took the day off yesterday for the 4th of July, I didn’t post any Cute Outfit Ideas – so, here you go! Since I know how much all of you enjoy these, we’ll do it on Friday instead. Did you have a fun time putting together a July 4th outfit? I went simple with white shorts, a blue and white striped shirt and bright red toes and nails. Plus some white sandals with major bling! There is no rhyme, reason or theme for this edition of cute outfit ideas. I found some outfits I love and wanted to share them with you. I think this first one is one of my favorites! a tank with an anchor! Which of these cute outfit ideas were your favorite? I’m still freaking out over the Michael Kors bag, anchor tank and starfish off the shoulder shirt! Looking for more Cute Outfit Ideas? Be sure to follow my Spring & Summer Fashion Board on Pinterest for some style inspiration! Next articleI’m Now a Sounfreaq and I Love It! 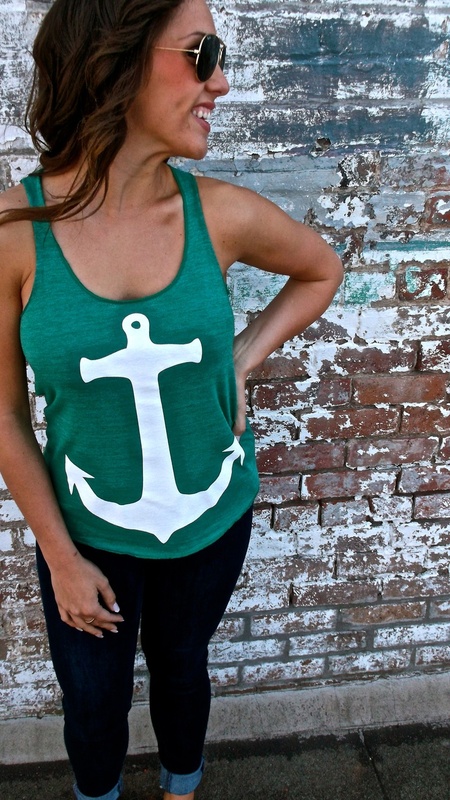 Where did u get the green anchor shirt? I love it! It was from this shop (http://www.shoptheelle.com/products) but it looks like they no longer carry it. I’ll do some more searching and see if I can find one. It’s CUTE isn’t it?! Where did you get that adorable blue and white top? Love it. Where can I find that plaid white and blue top? It’s wicked cute and I love the form fitting style. I love the top too!! Is it still available? These outfits ARE SO CUTE! I really like the pink one and the sweater with the maxi skirt. Feel free to visit my blog as well ? I too am in search of the blue and white top – can you please let us know where you found it? Thanks!! I really love the outfits you come up with and I’ve repinned so many of them. But I really wish you’d include a link to the items for puchase. I haven’t seen most of these in the stores I frequent, so for someone like me I need a site I can go to to check out pricing for these outfits. Hi, just wanted to let you know that I think your link is pointing to the wrong page on Pinterest. I ended up at Janice Bonner’s board, not yours. I was able to search on Pinterest and find the right one pretty quickly, but wanted to call it to your attention!